The goal of the project was and still is a simple one: to share stories, experiences, and advice that will help Christians to start their own local apologetics initiatives. Whether you be a pastor, youth pastor, teacher, elder, or lay person, this series of short essays could hold the keys you need to get things started in your own local congregation. Shortly after the first series came out, a year or so later, the second part of the series came online. 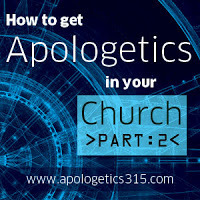 Here is the second part of the series, How to Get Apologetics in Your Church Part 2. These are questions we hear frequently whenever the word apologetics is mentioned. It probably comes as no surprise the word “apologetics” is foreign to most people, even who are a part of the Christian church. Evangelicals, who define themselves by their passion to follow Jesus’ command to “Go therefore and make disciples of all the nations”(Matt. 28:17) will usually look quizzically. Here is the table of contents for this resource to assist you in your embarking in the world of loving God with all our heart, soul and MIND. 17 – So You Want to Organize an Apologetic Event? That being said, I think it is high time we get busy and down to business to equip our people. Previous Post: Did the Gospel Writers Make Up the Gospel Records? Next Post: Understanding What Makes this Apologist Tick!